Origami is a popular Japanese paper artwork that is common to the elementary pupils. This paper-folding art is practiced and performed by the Japanese ever since the old times. In fact, the book entitled Sadako and the Thousand Paper Cranes is a true-to-life story, telling about a your girl in Japan who acquired leukemia as caused of the atomic bomb radiation way back in the bombing in Hiroshima during the war. Unfortunately, Sadako died, but the story she left remained as one of the favorites among the youth and even adults. The principles common to the art of origami was used by some of the scientists in Brigham Young University. This team of scientists created the 3D Printed tools for surgical purposes. Several 3D printed innovations, like the robogami and some folding electronic structures, were inspired on the origami principles. This is also what inspired Larry Howell, one of the professors in Brigham Young University, Spencer Magleby, Brian Jensen, and other mechanical engineering students, to do the 3D printed robotic surgical tools. Such tools are too small, but wide enough to fit into the incisions. Some incisions heal naturally and will not need sutures. For some incisions that need small tools, the small surgical tools make surgery more precise, allowing the surgeons to effectively do the procedures. There are also incisions that need large surgical tools, and here is where the principles of origami come in. The design of these surgical instruments is based on the origami folding, wherein its tiny and flat head will unfold and expand when inserted through incisions for efficient surgical procedures. This design resembles the D-Core device, which is a surgical tool that unfolds into rolling discs when placed inside the body. Similar to the concept used in the creation of the solar array for NASA, Howell and Magleby also used the origami concept in the creation of these surgical tools. 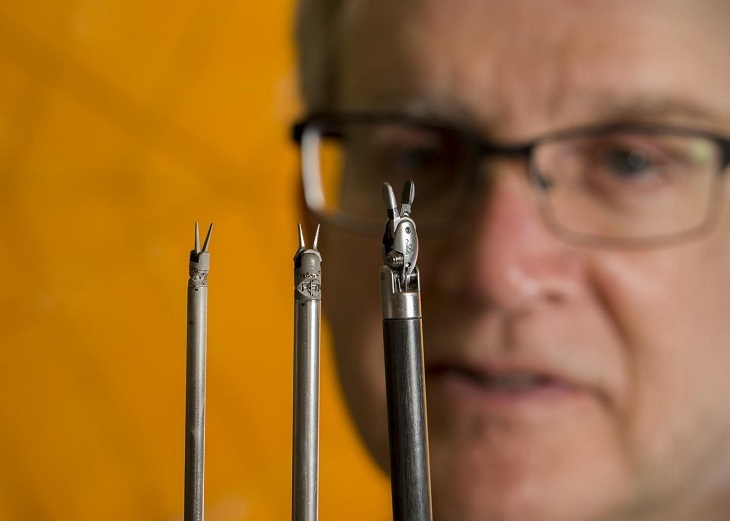 The team of BYU scientists collaborated with the team of Intuitive Surgical, who created the da Vinci Surgical System. As they go along the project, the surgeons learned that they need tools that are even smaller. The origami concept allowed them to go on and eliminate smaller parts such as pin joints. The tools they come up with are already flexible and foldable enough to do the work. The 3D printing is used to prototype the surgical tools and it allows them to complete the prototype, including its design, printing, and testing, within a day. With their extra time, they were able to test and create more experiments for the shapes and designs, leading them to formulate better tools. The aim of the team is to provide surgical tools that are not only smaller for efficient surgery, but also simpler for easy use. According to Magleby, these small surgical instruments are intended also for complex surgeries the surgeons may need to perform in the near future. The origami did not saved Sadako from her disease, but with its concept, it has been used creatively by scientists today to help surgeons treat more patients to save their lives.